A fish oil-derived medication may lessen the likelihood of a heart attack or stroke in patients who are at high risk despite taking statin therapy, a new study finds. The medication, which contains high doses of the omega-3 fatty acid EPA, cut the risk of death due to cardiovascular causes, heart attack and stroke by 25 percent, the researchers found. And that was on top of the risk reduction brought about by cholesterol-lowering statins, according to the study, published Saturday in the New England Journal of Medicine. The patients in the new study all had elevated triglyceride levels, with nearly 71 percent having been diagnosed with atherosclerosis and/or already having had a heart attack or stroke and the rest with multiple risk factors, but no heart disease yet. What we studied isn’t some over-the-counter unregulated supplement. It’s a prescription drug and very different from regular supplements. The drug, formally named icosapent ethyl — trade name Vascepa — contains a pure and stable form of EPA. Over-the-counter fish oil supplements contain some EPA along with other omega-3s, but in much lower doses than the prescription medication. Multiple studies have shown that OTC fish oil supplements don’t protect the heart, Bhatt said. That might at least in part be because one of the other constituent omega-3s, DHA, seems to raise LDL, or “bad cholesterol,” he added. The new study, a randomized, double-blind, placebo-controlled clinical trial, followed 8,179 patients with elevated triglycerides who either had diabetes plus another heart disease risk factor or had been diagnosed with atherosclerosis and/or had already suffered a heart attack or stroke, for 4.9 years. Patients either got 2 g of icosapent ethyl twice a day or a placebo that contained mineral oil. 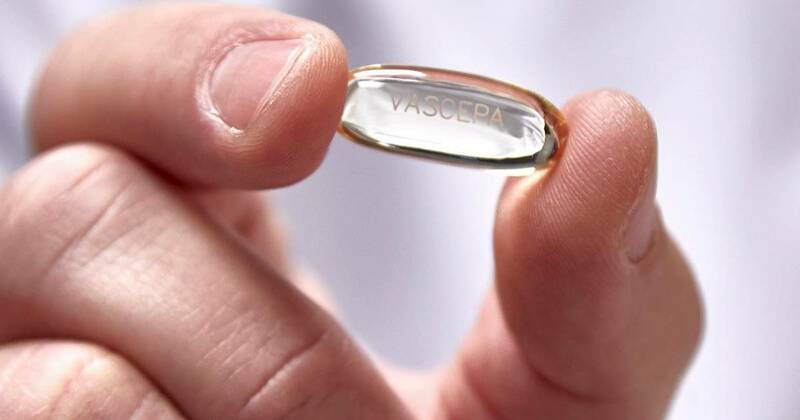 The trial was sponsored by the maker of Vascepa, Amarin Corporation. Patients were enrolled in the study if they were 45 or older and had established heart disease or were 50 or older and had diabetes plus another heart disease risk factor. Statins had already lowered the patients’ LDL levels, but they were still at high risk for death from cardiovascular disease. By the end of the study, hospitalization for chest pain, heart attack, stroke, cardiovascular death and procedures for coronary artery disease such as stenting had occurred in 17.2 percent of the patients taking icosapent ethyl, compared with 22 percent of the patients taking placebos. The researchers also reported a 24 percent reduction in cardiovascular death, nonfatal heart attack and nonfatal stroke —11.2 percent vs. 14.8 percent. While the drug did indeed reduce triglyceride levels, that reduction alone wasn’t enough to explain the size of the impact on heart disease in the group that got the drug, experts said. In fact, not since statins were introduced, Blaha said.